Let’s assume that you have selected a few companies for your shortlist and are getting close to the final stage of negotiations. At that point you already have the “asking” rate, which should be within reasons. Negotiating space in offshore deals is rarely above 30% and if asking rate is 100% above your expectation the vendor should not probably be on your list. First, most important, you need to set the focus of your negotiations. Your goal is not to minimize the rate but minimize the Total Cost of Outsourcing (TOC) over the terms of the engagement. TCO is an abstract concept unless looked at in retrospect, yet it could be reasonably assessed with some basic assumptions. After the assumptions are locked you can easily negotiate towards minimizing TOC. Next step is arranging your arsenal of negotiation options. You do not want it “all come down to rate”, that’s just one aspect of TOC plus it’s likely to stall the negotiations. List all aspects of the contract you could to negotiate and form your position on each of them. Offshore contracts typically offer large number of areas to negotiate, e.g. financial and payment terms, work hours, overtime rates, length of engagement, access to resources, multiple operation benchmarks and guarantees, etc. Each of these items could have a massive impact on the TCO. Research what is reasonable in terms of rates for your vendors. There are plenty of tools to do that. For example follow up with references the vendor should have given you (it’s amazing how much info you get if you just ask), check regional job boards to determine salary ranges, etc. Take you research data with grain of salt though, e.g. be aware of the timing of your data. For example I was involved in contract negotiation with the same vendor in 99, ’02 and just recently; the terms of the contract were somewhat similar, the rates for mid level java developer were respectfully $42, $21 and $27 an hour. Negotiation is a complex skill if not art. If negotiations are not particular your cup of tea you may consider involving professionals, in particular those who have experience negotiating offshore contracts. At least go through some serious reading on the topic prior to diving into the deal making. Here are a few great books to consider: Secrets of Power Negotiating by Roger Dawson, You Can Negotiate Anything by Herb Cohen, and Getting Past No by William Ury. One aspect of the rate is often gets overlooked – the rate changes overtime. The easiest approach here could be locking rate for the term of the engagement, yet it might be not feasible due to many reasons. You want to make sure that you do not get hit with huge changes and at the same time you do not want to find your vendor loosing money on your project due to for example natural changes in the cost of living. Linking rate changes to some objective index might be a path to consider, see an example below. Increase to then-current rates = the then-current rate on the first Anniversary X ((Current ECI / Prior ECI) – 1). If the ECI ceases to be published, then Consultant and Client will agree on and substitute another comparable measure published by the same or another reputable source. Location. Almost like in the real estate business location plays utmost important role in the cost of the product (rates in this case). Location granularity is roughly at a city level, meaning that in a single city you will have roughly the same rates for specific position. Large cities such as Bangalore, Beijing, and Moscow may have some pockets / districts with higher / lower rates, those differences are not as dramatic. Raising level of granularity to a country level skews the results significantly unless you limit your horizon to only “first tier” cities. Other geopolitical factors. In countries experiencing explosive growth or political turmoil standards of leaving fluctuate greatly and that inevitably leads to dramatic changes in rates. Rates of vendors from Eastern Europe and China have been growing at the highest rate recently. It’s no surprise considering major improvements in standards of leaving of these countries and weakening dollar as well. Competency. That’s an interesting phenomena I have observed over the years. It appears that engineering community competency has very notable local preferences. For example there is a great deal of skills in mobile development in Russia, Vietnam developers seem to prefer to speak .NET, you find many developers working with OS cores in Israel. Company size. Unlike in the food industry where large chains offer lower prices s/w outsourcing has opposite trend – typically you will be able to negotiate better rates with smaller shops. “Body shop” – under this model the vendor is focused on billable hours / resource utilization and is typically in the business of selling mediocre resources in bulk. This not the business model you will find presented in RFP or website of the vendor, however you will see it between the lines of the proposal, in general practices, etc. This model scales well and you can see body shops ranging from Krishna’s Shack to multi-nationals of colossal proportions. “Consulting Organization” – same as above but with vigorous attention to the quality of resources. These organizations are typically smaller and have much higher quality of the resources. “Boutique shop” – I use this term for small sized high-end consulting firms which offer top quality resources often in a very narrow field / niche. Rates naturally would be the lowest for first model and the highest for third. The questions of course is appropriate analysis as most of body shops present themselves as consulting organizations and some smaller one pretend to run “boutique” operations. Engagement model. There are plenty of models you can elect to work with offshore, for example resource augmentation on T&M basis, fixed bid engagements, Built-Operate-Transfer, Managed ODC, etc. Each model will offer slight adjustment to the actual rates. Contract details. Rate can vary greatly depending on the details of your contract, with each element being a double edged sward though. For example you can reduce the rate by committing to large number of the resources or longer term of the engagement, by agreeing with termination fees, etc. The conference call I had with my ex-partner in Noida, India was quite unusual and it’s worth mentioning. Two PMs, AM and I were going in circles for 30 mins in attempt to solve a $10,000 conundrum. About a year ago we purchased 3 servers for our team in India, at roughly $3K a piece. The relationship came to an abrupt end due to major reshuffle of the road map on our side a few months ago. Naturally we wanted to get our servers back in a form of iron or cash. That turned out to be unreasonably costly. As it turned the servers were in some special industrial zone and to get them out of the zone we would have to pay a de-bonding fee to India customs. The fee at this point would be about 75% of the price of the new server, supposedly if I would wait for about 5-6 years the fee would be reduced to almost zero. But today to get the servers to San Francisco between shipping and customs I would have to pay the price of new server for one year old box I already “own”. I could not even donate the boxes to any of my friends in Noida – they would have to pay de-bonding fee to take the servers off the vendor’s premises. Talk about hidden fees and small print! Administration fees, a bizarre combination of fees including janitorial, rent, etc. What is important here is of course not the fairness of the fees. You need to inspect every inch of the contract, every caveat and clause to avoid surprises and control your total cost of outsourcing. Hopefully that will save you from serious blunders and oversights like mine. Loss of team support / respect / relationships with the team. Even the most open minded employees on your team will be concerned with offshore introduction. And they should, the practice of outsourcers replacing the sheer fabric of the company, it’s all too familiar. As an instigator of the process you are likely to become a target of negativity. It comes in all shapes and forms with essence being “you are a traitor of ”. I remember well one of my key architects giving me an ultimatum “it’s me or them”. I do not know of any bullet proof shield here, the chances are some percentage of loss will happen no matter what you do. For me the best risk mitigation strategy in this case has always been transparency and honesty – when you can afford it. I do my best to personally deliver the message to every member of the team or alternatively setup a process which ensures consistent and accurate delivery of the message. Loss of team spirit / internal unease. Mutual trust even in small teams has some level below 100%. Even a perfectly delivered message will be taken with a grain of salt and generate negativity. So only medicine here is reinforcement of the message – positive reassurance is like food – you can not get enough for life time in one seating. Decrease in team’s productivity / commitment. Loss of key personnel / technology and business knowledge loss. Loss of team spirit / internal unease even if managed well is likely to result in tangible losses. You need to plan for them in advance of introducing the idea into your organization. Do you have sufficient redundancy in your organization to deal with inevitable loss of key personnel? Are your schedules have sufficient padding to cover for loss of productivity? Are your knowledge transfer / retention devices in place? If answer to any of these and similar questions is ‘No” you need to deal with closing the gap first and searching for vendor after that. On a personal front the risks are substantial as well. What would championing an offshore initiative would do to your career? What’s your organization’s risk tolerance? What is its failure tolerance? How would the failures of the vendor affect your position in the organization? And so on – there are countless questions to ask here. But even more important set of questions is around lifestyle impact. Are you prepared to shift work hours? Are you ready to deal with the never ending stress? What is your own failure tolerance? The idea of this post partially came from Offshore Visits. Tom’s post is about visits to an existing vendor, the visits during vendor selection process are quite different though. I am fairly convinced that the unwritten rule – “must visit perspective vendor site to make a selection” was originated by offshore sales force. This is a well known closing technique similar to test driving the car (“must drive before you buy”) a.k.a. “puppy close”. The goal of the salesperson is to build your commitment to purchase and getting you involved, getting you to invest the time paves the road to closure. From vendor’s standpoint on-site visits help tremendously in many other dimensions, for example having you on their territory (care salesperson would take you to his office “just to discuss some details”), playing one of the strongest powers of persuasion – reciprocity, etc. Visit several vendors on the same trip. Separation of duties may help a great deal – if it’s at all possible use people not involved in the final decision making to go on the trip. Be the driver of the agenda for all meetings on the trip. Concentrate on your needs and things you should accomplish on the trip. Take a few days off after the trip to do some personal travel and enjoy the scenery which you may never have a chance to see again. Check out employee lifestyle – workstations, libraries, transportation, food, break rooms, wallpapers, etc. Macro Factors. This group includes criteria important for selection of outsourcing region and type of outsourcing organizations to pursue in your search. Critical Factors. The group of selection criteria covers items that are critical for the success of the outsourcing initiative. Relevant Factors. While these search criteria are important I always take them with a grain of salt as assessment of these factors is complex / subjective. Things to Consider. Tie breakers, items of relatively low importance which could still affect your decision with consideration of special circumstances, etc. And Personal Factors. That is a very important group of criteria if you are the person who has to carry on the engagement. If you only charged with selection these items should reflect needs of future stakeholders, assuming they could be reasonably assessed. My recommendation is that you take a critical look at the list below and pick only items of the high importance; selecting vendors based on an excessive list of criteria would be a daunting task. Geography – Region / Country / City. Impact of locale on outsourcing initiative is multifold; in large degree the geography determines time differences, language, culture, history, average rates, typical turn over ratio, etc. There are however some notable fluctuations based on specific city and company. For example some companies in Eastern Europe change their work hours to minimize time difference. Political Stability. Political stability will affect multiple aspects of an outsourcing relationship, an impact range from minor fluctuations in productivity to mandate to cease the operations. Legal System Maturity. Generally you are not planning on going to curt with the vendor yet you should never dismiss a possibility of that happening. What’s good about your NDA or MSA if its clauses are not enforceable? Company Size and Organizational Structure. The attention you receive from the vendor is directly proportional to percentage of revenue your business represents; see offshore outsourcing Rule # 1.
Business Model Match. Search for vendors that support and have track record of executing under the outsourcing model that is right for your organization. See Vendor Selection Rule # 3. Financial Stability. Multiple aspects of financial stability are important factors in the selection process, with most important being profitability and cash reserves. Time in Business. The time in business should be defined as the time in doing business in specific model / under specific circumstances matching your needs. See Vendor Selection Rule # 3.
Business Focus. 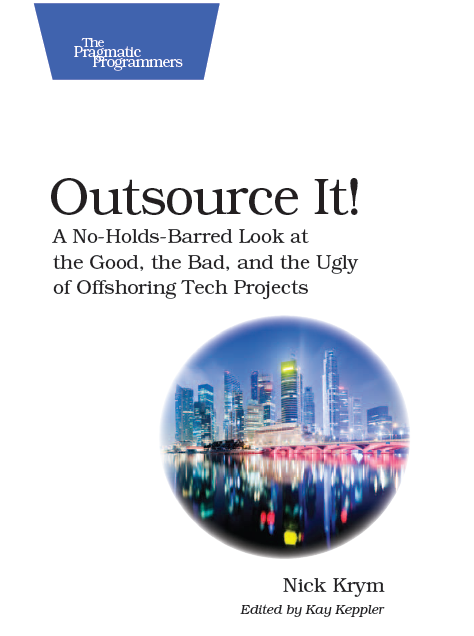 Many outsourcing vendors chase any and every business opportunity inevitably creating organizations with unstable structure, staff and culture. Capability Maturity. Certification level. See Vendor Selection Rule # 2. Make sure that certification is applicable to the specific ODC / location you are considering. Access to the Top. Level of access to executive management / decision makers. See Vendor Selection Rule # 4. Methodology Match. Is methodology you are planning to use is in DNA of the vendor? Does vendor has a track record / history of using specific methodology in the target ODC? See Vendor Selection Rule # 3. Keep in mind that methodology is bigger than just SDLC, it should cover project / program management and other essential process. Delivery Track Record. I would give that criterion a very high weight and would do my best to assess the track record of success on engagements similar to your initiative. Keep in mind specific aspects of your engagement such as change rate ratio, urgency of deadlines, etc. Staff Competency & Domain Expertise. It’s clear that staff competency is critical to the success of the initiative. To rate that criterion you would need to decipher what the competency of staff assigned to your project would be. That would require understanding vendor current state of competency, sourcing and competency building methodologies. Training. Tightly related to previous item this one is all about assessing what vendor does to sustain and increase competency of its employees. Knowledge Transfer and Retention. With turn around being unavoidable knowledge transfer and retention are critical to “average competency” of the organization. To rate that criterion you will need to understand what tools, processes, and methodologies are used by the vendor to assure continuity of knowledge. HR Practices, Staff Sourcing & Development. Vendor activities in order to find (“source”) and retain its employees are critical to countering turnover and increasing “average” resource competency and quality. Data Security & Privacy. This criterion is particular important if your organization is dealing with sensitive data such as financial or HIPAA covered data. You need to look into multiple aspects of security (policy, physical, network, data, etc.). Assessing state Data Security & Privacy could be very time and resource consuming. Asking for results of a third party audit is probably the easiest short cut. IP Protection. IP Protection is a critical factor yet assessing it is extremely challenging, see some of my thoughts in Protecting Data and IP when Outsourcing Offshore. Organizational Mission. Alignment of organizational missions may have a good positive impact on success of your project. The chances of finding the alignment are not high though. Client Management. Client management or account management is especially important when access to the top is limited. Quality Management. Some organizations, in particular those high on CMMI scale, offer somewhat independent quality management which could be a value ad to the engagement in a long run. Organizational Statistics. Organizational statistics, such as %% of sales vs. development, %% of people with advance degree, etc. could offer interesting insights on the organization and suggest trends. Outsourcing Tools. Engagement tools such as communication dashboards, time tracking tools and others could offer substantial value in tracking the progress. Specific Expertise. Narrow niche domain expertise or specific technical competence offered by vendor could be important if not critical factor. I find counting on that fairly risky. Network Infrastructure. Many outsourcing companies today offer network infrastructure at par or even better than you may have in house. Its sufficiency needs to be verified though. Telecom Infrastructure. Similar to the item above, strongly related to geopolitical criteria. There is a great variety of personal factors that should be considered. They range from personal preferences to geography to your own risk tolerance, from your career aspirations to knowledge of foreign languages. And depending on your relative weight within organization they might be even more important than critical factors.